This huge red gemstone filled with fire, is flanked on each side by a shield-shaped Diamond together weighing approximately 3.00 carats. 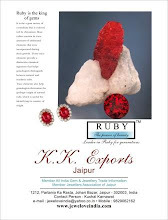 Highly homogeneous and vivid color of the Ruby can easily be appreciated in the image above. This combination of size and the quality of color is rarely found in the natural form of Rubies. The ring was auctioned for a huge amount of $2.2 million recently. What do you think about this beauty? Share your comments and reactions below.